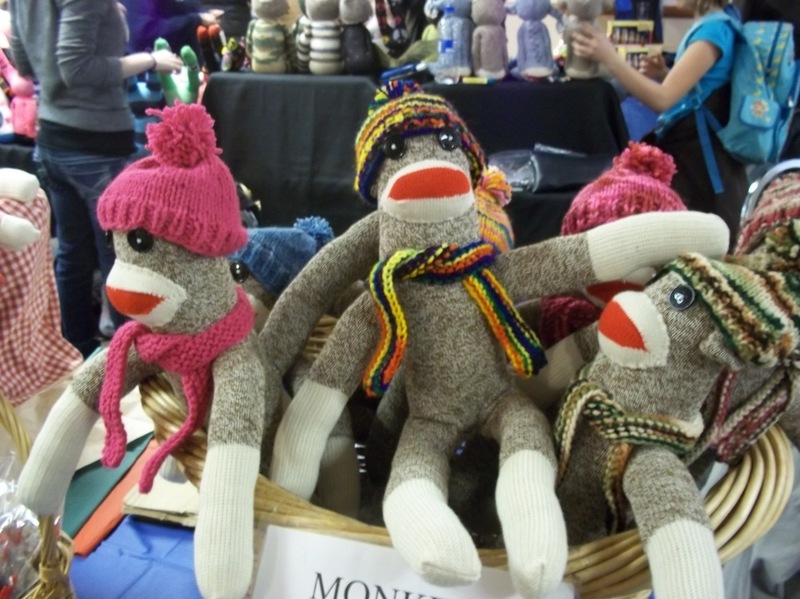 (Sock) Monkey Business: A Festival For Iconic Toy Sock monkeys, the red-mouthed, yarn-topped toys with a wide smile, were born during the Great Depression and handcrafted for the working class. Devotees of the little critters are still cherishing them at the annual festival dedicated to the Sock Monkey in Rockford, Ill.
Sock Monkeys at the 8th annual Sock Monkey Madness Festival in Rockford, Ill.
Adele Jedynak makes monkey sounds to a group of kids who are steps away from playing Sock Monkey bowling and plush-primate parachuting. It's all part of the Sock Monkey Madness Festival, the eighth annual festival dedicated to the sock monkey in Rockford, Ill.
Why Rockford? The Nelson Knitting Co. made and sold Rockford Red Heel work socks in the industrial city from 1932 to 1992, when it went out of business. The iconic socks were used to create the granddaddy of homespun kitsch. In the 1950s, the company got a patent and included the Sock Monkey doll pattern with each pair of socks; people went bananas. Mark Herman, curator of education at the Midway Village Museum, host of the two-day indoor festival, says there's a difference between the famed Sock Monkey and ordinary stuffed animals. "I think it's often made with endearment," he says. "I think it's a matter of grandmothers and moms and people making them as gifts for other people and I think that's what really connects the memory part." That's what attracted Martha Pyles to bring a shopping cart — yes, really, a shopping cart — filled with her cotton treasures to the festival. "My grandmother made them for all the generation in my family ... when I was a little girl," she says. "And then my mother made them for my grandchildren." 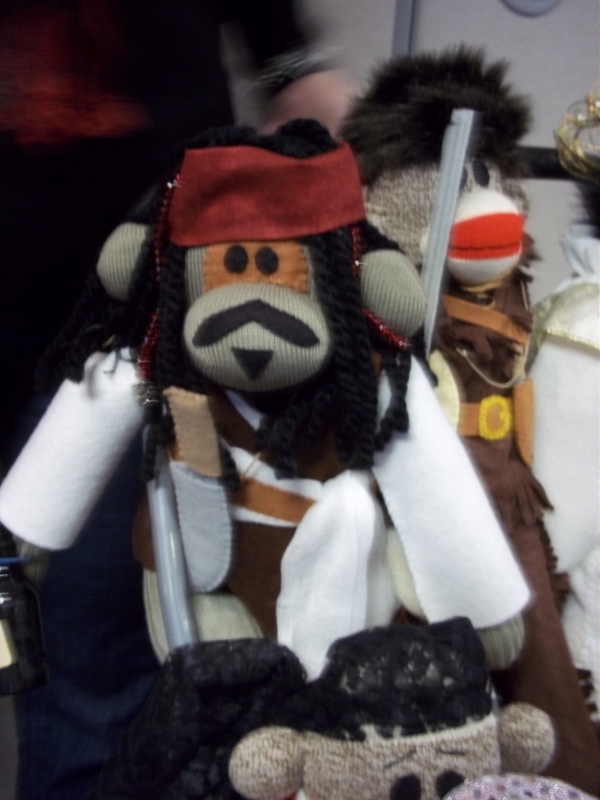 Martha Pyles' Jack Sparrow Sock Monkey. Her Elvis lookalike won last year's best of show at the festival. Her Elvis lookalike Sock Monkey was last year's best of show at the festival. This time around, she made a Jack Sparrow Sock Monkey, complete with dreadlocks, for the contest. Nearby, Joe Kroc and his friend Megan Saba are seated at an accessorizing table to give their companions some bling: colored cotton balls, fabric and shiny buttons for missing eyes. Kroc gave his traditional plush some pizzazz. "This is very eclectic," he said. "We've got camouflage shirt, Santa hat, and then the rest is pure Sock Monkey." "We named it Rocky for Rockford," Saba said. It's all about the names. Grayson Blakemore took his brother's toy — Scooby-Dooby-Doo — to a makeshift clinic, also known as Sockford General Hospital, because the mouth was tearing and it was missing something very important: an eye. Volunteers at the hospital dressed as nurses, stuff and sew the monkeys back to their former glory. At the other end of the hall, Emily Yarger peddles sock monkeys. Her mother helps her craft standout sock monkeys to sell. "We love really bright socks and bright colors. ... The thing is when you make a monkey ... they kind of take a personality of their own," she says. One of her creations caught the eye of Max Green. He added to his collection with an orange-vested monkey. He says it's a true example of folk art. "I think a big part of it is just the history behind it, they are made in America; they are made out of materials that are made in America," he says. "I think that's a big part of it, too." Whether it's a traditional or funky sock monkey, these huggable heroes all have a story: lovingly made from scratch, and built to last, unless your little brother accidently pulls its eye off.